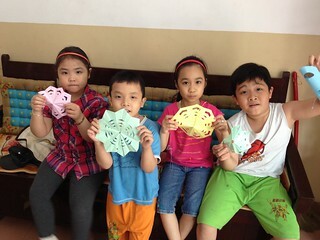 nine-pointed stars and snowflakes | bahá'í children's class ideas! There are several ways to make nine-pointed stars out of paper. You can paste together three paper triangles, or create a triangle template and use it, rotated three times, to trace out a nine-pointed figure onto another sheet of paper. Our favourite method, though, is one that we learned from friends in Vietnam, which relies only on folding, similar to origami. This video describes the folding process step-by-step. The nice thing about this method is that you can easily take things a step further to make beautiful nine-pointed snowflakes. You can also download a printable guide to help you make your stars and snowflakes! 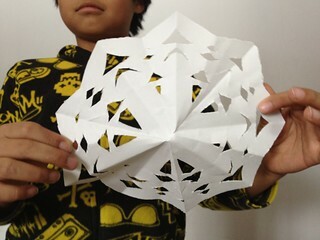 Can you send me something I can print out with instructions for the 9 pointed star simple origami, and the snowflake? I can think of many uses for this knowledge and skill! I am a craft impaired person, so I have to have the directions right beside me and practice, even if I saw it on a video. Hi Jacque! Sure, I think we could put that together. I haven’t had a lot of spare time to work on printables lately, but you’re right, it seems like it would be a pretty useful resource. Thanks for the suggestion!